With race organisers reducing the length of the stage due to poor weather conditions, final results were decided following the first of two timed specials. Despite a few minor navigational mistakes early in the day, WR450F Rally mounted Adrien Van Beveren quickly got back up to speed and went on to complete a near perfect special for third overall. Confirming his status as one of the rally's most consistent competitors, the Frenchman is now third in the provisional overall standings, one stage before the 2017 Dakar Rally's halfway point. "It was a very good stage for me. Despite slippery condition I was feeling great on my bike today. The special stage was difficult. There were so many corners and some quite technical riding from start to finish. My pace has been pretty good today. A few kilometres into the special stage there was a part with really tricky navigation, where lots of riders got lost. I slowed down, took it easy and luckily managed to find my way out in just a few minutes. I think I was one of the first riders to get out of that part and this helped a lot for the rest of the special. It's quite encouraging to finally get a top three result in this rally. It gives me some extra motivation for the coming week. It's a very long Dakar and my plan remains the same - I want to keep taking one step at a time, staying focused on each stage and each day." 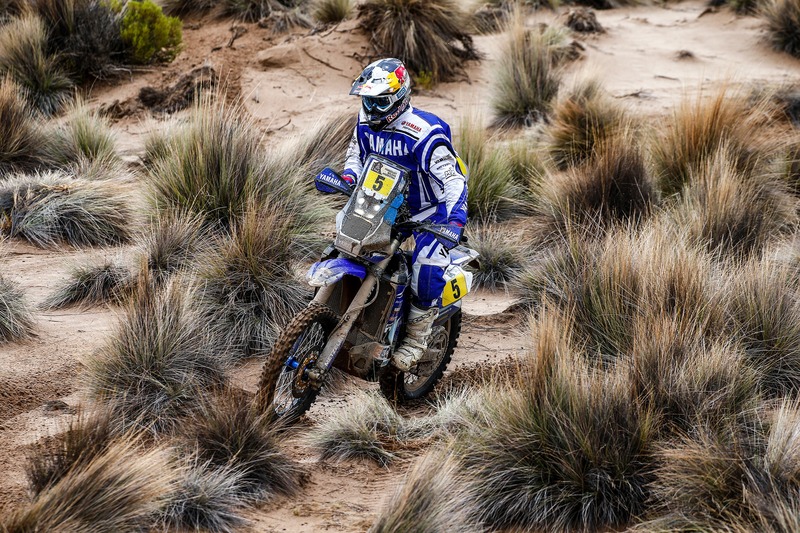 "Along with the cold and the rain today's stage was really difficult in terms of navigation. Most of us lost time in the beginning of the special stage and we had to struggle to find the right way out of a very tricky part of the stage. Overall, I'm satisfied with how things are going. My bike is running great and I am gradually making up for the time lost during the opening stages. I'm now pretty close to the top 10 in the overall, but obviously my goal is to go way beyond that. This is one of the hardest Dakars in my career and it's still a long way until the finish line in Buenos Aires. Everything is possible and I just need a good stage to put myself in contention for the top." "Today I pushed from the start and managed to get a good race pace in the first few kilometres of the special. I caught up with Barreda and we rode together for some time. Then we reached this super crucial part in the special, where everybody got lost. Other riders came as well and we lost time. I was the first to find the right way out of that point, so kept plugging away trying to make up for the time lost. My result from today might not be that good but we're still well placed. In the Dakar you can't expect things to work in your favour every day. Today might have been a rough stage for me but I will be back." "The most important thing for us is that today we showed we remain fully competitive and capable of fighting for the top. We had our fair share of bad luck during the last few days with Alessandro and Rodney forced to sit out of the race, but there's still a long way to go. Adrien, Xavier and Hélder are all doing a brilliant job and our goal now is to reach La Paz. During the rest day on Sunday they will have the chance to catch up on some sleep and regain energy for the second week of the race. Next week will be a lot different and we shall be prepared for that. In my opinion there's not more than a couple of riders who will be able to keep fighting for the victory until the very end and we want all three of our riders to be amongst them. It's really important that all our riders give their best day in day out and so far I can honestly assure you that they're all doing so. We want to reach La Paz tomorrow inside the top and then take things one step at a time."